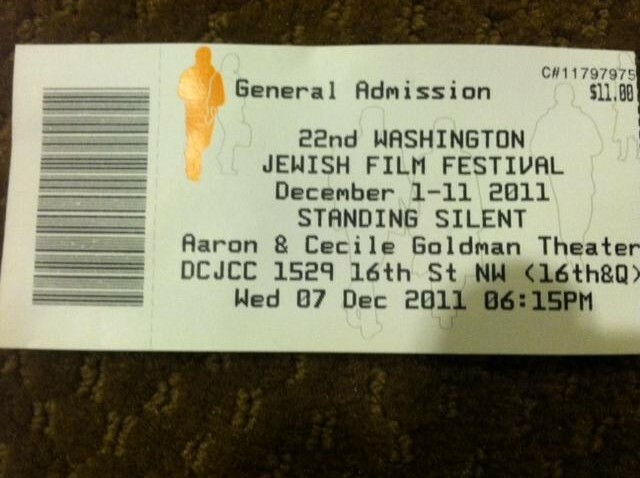 Standing Silent (Directors: Scott Rosenfeld and Malachi Leopold) is a disturbing film. But then it is meant to be. A Rabbi who molested children is “outed” but seems to get away with it. The “outer,” molestation victim Phil Jacobs confronts antagonism in the community. No one wants this shared and that’s part of a problem the film illustrates. The outrage among all parties is palpable since the locale is nearby Baltimore with some of the film’s principles working in DC as we speak. This is a high quality production and with people featured in the film up for Q&A in the intimate Goldman Theater: like Journalist Phil Jacobs this was as high-impact as it gets. Esther and Me (Director: Lisa Geduldig) sprang from a visit with Esther Weintraub, an 87-year old personality living in a San Francisco retirement home. Weintraub opens up and shares her (sometimes hilarious) take on her life. From depression-era poverty in New York City as a teen-ager, to her upscale modeling career and into her stand-up comedy days, taking on layers of humanity all the way. These she shares as filmmaker Geduldig starts taking Esther on outings to San Francisco’s diverse neighborhoods and social events. What a girl. You’ll grow to love Esther, human every step of the way. I shot my Love (Director: Tomer Heymann German, Hebrew, English subtitles) is a fascinating (and successful) take on the home movie format. Unflinching, annoying the people who are part of the cast, beautifully intimate focus on eyes and on lips. A technique that tells us as much (or more) about the filmmaker as it does about the story he’s filming. Tomer has always filmed from when he was a child, mimicking his father who inspired the boy. When Tomer’s German lover Andreas arrives in Israel and family becomes involved, it digs below the skin and prods the viewer at many levels. Politics, religion, gender issues, even housework are all touched on but at the heart of this film is the depth and endurance of feelings.